Here’s where I found myself years ago. Can you identify with any of these? Being open to God speaking direction and purpose into my life, but never sure I was hearing God. A shift occurred as mechanical prayers were replaced with true interaction with God. I moved into a conversational life with God that is adventurous and full of surprises. This happened as I began experimenting with contemplative prayer and a meditative approach to Scripture. Contemplative prayer is about being with God and listening for God’s input whenever God may choose to speak. We no longer ask God to do things for us but we enjoy God for God’s own self. We assume that because knows what is best, God is willing to help us move into a place where we are ready to do that. We no longer have to try to be what we are not; the Spirit does the heavy lifting and we join in. Typically contemplative prayer involves listening not just talking, asking questions not just suggesting answers. In doing so, God brings us around to the “mind of Christ” about relationships, finances, health, service. With this approach, we are more likely to experience the Trinity’s unshakable love as well as challenges and nudges to move forward in shared mission. If you’d like to walk out how to do contemplative prayer, you can read a short article about it: No Better Place To Be than With God. Even better, you can join others in discussion and practice in a 4-week online course on contemplative prayer offered by Contemplative Journal, which is a website/online magazine/sponsor of online courses. 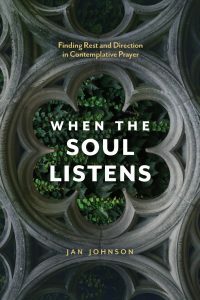 Based on When the Soul Listens, each week includes 2 short talks (Mon/Wed) and 2 simple practices (Tue/Thu). Participants share on a private webpage.